I've long been interested in the hidden, or the obscure, or the secondary, or the non-essential backgrounds and foreground in prints--more so at times than the subject of the print itself. This thinking certainly applies for me nowadays when looking at another engraving of Winchester or another view of Rome or another prosaic cityscape--the main focus of the images are of course beautiful, but since I've seen this stuff so much my eye started wandering around to the small and inconsequential bits in the scene, and found that this is where odd richness might be. And so on to what is in my mind, at least, an iconic wood engraving of the half-completed* Brooklyn Bridge, showing master mechanic and chief engineer of the project E.F. (Frank) Farrington making his slidy way as the first person to cross between the two spans (on 26 August 1876). 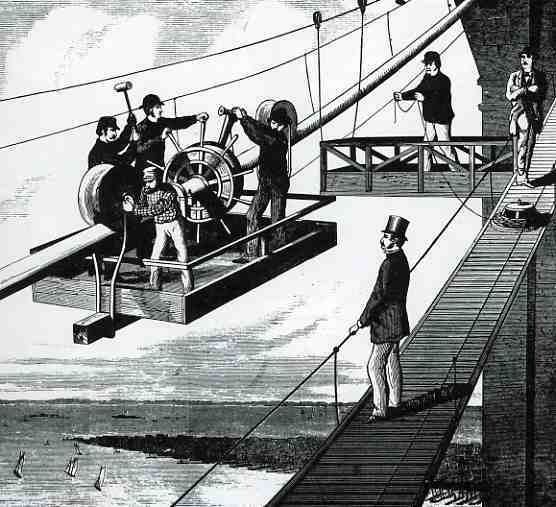 Another interesting peep into the times is seen in this wood engraving from 1877, showing a crew working on the cables. As much as eyewitnesses claimed that Farrington performed his stunt to exhibit the safety of the cables, looking closely at this print shows the relative danger faced by the workers. The railing around the support car here looks more like a hindrance than a help, seemingly making it easier for a worker to trip on it, and fall into the water 300+ feet below. Below-knee-level barricades surely does not make for a safety fence--it is very probably anti-safety. That said, if you look closely at the man on the extreme right, he seems to be sitting on the safety cable, leg up, nonchalant, watching the application of the cable. Tempting fate. I guess though that the most hidden aspect of the building of the Brooklyn Bridge was the identity of the chief and overriding builder: Mrs. Emily Roebling. It turns out that the original designer for the bridge, John Roebling, was killed early on in an explosion and was replaced by his son, Washington, who in turn (in 1871) was terrifically incapacitated; Washington was 'aided" by his wife Emily (1843-1903), who became the most recognizable spokesperson and sub rosa engineer of record. She was supposed to be assisting Washington, but it was far more so than that. Probably it was an inappropriate time for society in general to believe that a woman was capable of supervising the construction of the world's longest suspension bridge. *The bridge was about half-way done, following the construction beginning in 1870 and its opening in 1883. JF Ptak Science Books Post 1903 Part of the series on the History of Blank, Empty and Missing Things: Chinese Rail Workers, 1869. One thing that you seldom see so juxtaposed in the photographic history of the American West are the people who were so important to it placed in proximity to those who were no well disposed to recording their existence. For example: this image by J.B. Silvis, "China Section Gang Promontory", a photograph published as a stereocard between 1869 and 1870, shows a small group of Chinese workers setting two rails in Utah--they are the ubiquitously missing elements in historical images of transcontinental railroad construction. There were many thousands of these workers who were set to notoriously difficult tasks in bad situations and under time constraints with little liberty or pay (and not well-afforded much protection under the law), and in the history of documenting the expansion of the railroad across the West these workers are very seldom seen. They are set incongruously in front of a photography car that so often saw through or around them. The car was labeled "U.P.R.R. Photograph J.B. Silvis Stereoscopic & Landscape Views of Notable Points on line of Pacific R.R. Always on Hand", and I found it tempting to try to see in the photograph that it was made solely for the photographer's advertisement, but the central placement of the workers makes a good argument against this. On the other hand, when you look at some of the other work of Silvis documenting his railway car (see here), there are a number of group images where he gathers cowboys or Indians or makes a photo with his car in an unusual place, he is definitely using those people and locales to establish the idea of remoteness and wildness of the places in which he was working. It seems to me that in the end, he was using the Chinese laborers as a piece of his advertising ensemble more than documenting them. Again, this is very speculative. It is a very unusual image which I think is knee-deep in irony. I should also like to point out that most of the workers have taken care to sew large leather patches on their breeches--that to help their thighs when pulling that heavy metal lever across their bodies while setting and moving track. Here's an interesting bit I just slipped into while looking for something else. In 1880, half of the population was 10+ years old. There were 17 million people at work, and of these 1.1 million were children, making about 6% of the entire workforce. And that's about as truthful as we'll ever know about that statistic--given the relatively primitive way in which these numbers were corralled, my guess is that there were considerably more children at work than this. And it looks like of the total population of male children aged 10-15 (3.37 million) that 1.1 million of them--about 29%--were working, mostly it seems in the fields. This work was one of the early best-sellers from the time of the Incunabula, a book that went into 33 editions between 1475 and 1500, and into five different languages, and a number of different authors/annotators and publishers--a book with a very full publishing history. The Fasiculus temporum, by Werner Rolevinck (a Monk and renowned historian at Cologne, 1425-1502), and printed originally in 1474, is an early history reaching back to the Roman times, and perhaps one of the very earliest chronological histories. It was a compendium of reaches into dim dust, histories including plagues, epidemics, diseases, monsters and other interesting bits. It was also illustrated; some of the woodcuts were used several times in the course of the book; many were quite interesting. For example, the image above, showing the storming and siege of a town, features the normal allotment of soldiers, plus--extraordinarily--a cannon. What brings us to the History of Lines series is that the structure of the book is very impressive--and complex. It must have been quite a chore to set into type, as the text lines vary impressively--that, and the chronological nature of the work has text running normally, and then top-to-bottom, occasionally upside down, and then quite frequently in circles. Anyone with any experience in letterpress printing could quickly appreciate the effort it took to put this book into print. We're in the midst of having a new blog site! In addition to the new big coming changes, I've been told for the first time how many posts are in my various categories. And that there are 6,630 images posted in the blog. I've selected a few representatives of design for the covers of pamphlets and books published in the field of rocket development and space flight published in Germany in the 1920's and 1930's (with one from the 1951). They have a certain expectant sameness them, and, as leading publications in their field, have a remarkable similarity in their (black and white) design. The combined efforts of these works wound up in the engineering labs of Peenemuende and then int he V-1 and V-2 rockets that pulverized the United Kingdom during WWII. Later this same expertise, and some of the same engineers, "wound up" in the United States developing the American space program. The most famous of these Paperclipped scientists was Wernher von Braun, whose name is so intimately connected with the Vengeance Weapons as well as the Apollo space program. It is interesting to note that for many years if twas impossible to find von Braun's name on any exhibition description in the Air and Space Museum in D.C.--it just wasn't there, so far as I could tell, on no displays, even though I went looking for it pretty closely. On the 30th anniversary of the Moon landing, I went to von Braun's grave to see if it had been remembered in any way--there wasn't anything there, just his simple small slab, next-door to and within eyesight of a Jewish cemetery. Rudolf Nebel (1894-1978), very early member of the Raketenflugplatz, assistant to Hermann Oberth and very nearly the first to successfully conduct an experiment with a liquid-fueled rocket, beaten to the finish line by a man whose work he was not familiar with, Robert Goddard. He defined right-wing in the Weimar era, and was part of a paramilitary organization called Stralheim; Wernher von Braun seems to have succeeded in the avenue that Nebel tried to travel along. Nebel published this work in 1932, a year before the Nazi party came into power, and before his crotchety problems with teh SA began. As I've written about on this blog before, Blank, Empty, Blank and Missing Things can be of great importance. For example, if human conversation wasn't mostly filled with nothing, it would be difficult for us to process anything, everyone sounding like several mockingbirds calling away at once, all of the time. Music would be difficult if there were no silent interludes. And of course since existence is made up vastly of nothingness, to have it be filled would present a, um, problem. It also might be interesting to invent an 18th century board game based on the discovery of nothing through the ages...or maybe 16th century, when the idea of zero in mathematics was first coming into widespread use. My interest in Nothing today comes along with design and epochal scientific publications--or at least highly significant appearances of great ideas. Sometimes the typography and design of the title pages of Great Works turn out to be very surprising--and sometimes that surprise in blankness is an unintentional result. Also we'll just discuss relatively recent works of the past 150 years or so. Design changes quite a bit from the 18th to the 19th century so far as scientific and technical title pages go--the earlier design (and particularly the illustrated versions) are another matter. First, the intentional bits, like this fine example of Niels Bohr's superb introduction to the rest of the world of modern atomic theory (based upon the Rutherford model and Planck's quantum theory), "On the Constitution of Atoms and Molecules" (in the Philosophical Magazine for July 1913). In this case (which actually is a three-part paper), the offprint to the publication has an upper part that is blank because it excludes the closing paragraphs of the preceding article--offprints being the separately-published and bound author's article that were meant to be distributed privately and prior to publication of the appearance of the contribtution in the journal. Putting objects of different classifications into the same scale for the sake of comparison is a relatively recent idea in the history of printing. It really wasn't until Etienne Durand's architectural textbooks of the 1850's that buildings by different architects were displayed on the same scale on the same page. Likewise, too, the cartographic depiction of mountain heights and islands and lakes and rivers side-by-side and on the same scale didn't take place in earnest until mid-19th century. My favorites relating to geographical items are those that take, say, all of the major islands in the world and remove them to a single sheet of paper, all in scale, so that it would be easier to compare their sizes without the distraction of the rest of the map. It really does put things into perspective, giving the reader a good, strong look at just how small some of these countries were in comparison with the United States. Many of the combatants of WWI are here--and its quite sobbering to think of the enormous casualties incurred in some countries and the very small area that those millions of dead and wounded would have taken if placed in a similar locale in the U.S. An excellent example of this is Belgium, fitting very nicely into less than a tenth of the state California, where so much killing and suffering occurred. Thinking of France as battlefield that was limited to about 60% of the size of the combined four states of New Mexico, Arizon, Utah and Colorado, and then thinking of most of the largest battles of WWI taking place in an area about a quarter of that is, well, incredible. Using this as a guide, less han half the state of Colorado would've been the seat of the battles of Verdun (976,000 casualties), Marne (750,000), Somme (1.2 million), Cambrai (700,000) Arras (278,000), the Spring Offensive (1.5 million) and the Hundred Days Offensive (1.8 million),plus all of the rest of the action, and you get a little bit of a better idea of the bloodiness of that acreage. Placing things in comparison in the same scale, side-by-side, is an excellent means of insight. The Probierbuchlein (Probir Buechlin/auff Goldt/SIlber/Alle ertz und Metall. Mit vil kostbarlichen Alechimeijischen Kunsten...) printed in Augsberg by Christian Egenolph in the autumn of 1530, was the first German book to deal with the significance of alchemy and metallurgy. I think it usual to think of the work of Georgius Agricola (1495-1555) and his justifiably famous De Re Metallica, but the anonymous (?) Pribierbuchlein predates the work by at least 36 years. There's not much else of a comparison between the two works save for the earliness of the Probierbuchlein, as it was 48 folio leaves and somewhat restricted--but first is first, and it may have made the way easier for Agricola, whose own efforts paved the way for the systematic study of the Earth Agricola made fundamental contributions to mining geology and metallurgy, mineralogy, structural geology, and paleontology, and outlined them all beautifully in a book that was ten times the length of the Probierbuchlein, and also fabulously and sumptuously (and usefully) illustrated. I'm sure this would have been a beautiful thing--I picture is red on black, with an ultra-shine. I'm also sur ethat it would have been a delsight. Source: Popular Mechanics, August, 1934. When I went to research this phrase, above, I was surprised to learn that it is about half as old as I. Playing on a slightly older expression, "Le bon Dieu est dans le détail" (the good God is in the detail), commonly attributed to Gustave Flaubert (1821-1880), and of course "God in in the detail/s", the "devil" part seems to be only from the mid/late 1970's--a surprise. Nevertheless, we are still left with a surprise in this devilish detail from the incunabulum of St. Augustus, De civitate dei....(this printed in Basel by Johann Amerbach on 13 February 1489). It shows it in its two panel woodcut the illustrious saint at top, working away at his desk; and at the bottom a battle between the cities of Babylon (founded by Abel) and Zion ("Syon", by Cain). In this battle Zion is defended by devils, and the devils are armed. The angels of Babylon appear sympathetic but unresponsive to the devil-play, while an angel at top left seems to be blessing its devil enemy who seems to be scaring/screaming at her. In any event this is a lovely and complex image coming in the fourth decade of moveable type printing. Now: regarding Zion and Augustine, I really don't know why the writer is putting devils in charge of the defense of "the city of the living god". The many-times-mentioned Zion of the Old Testament, "...Zion, the perfection of beauty, God shines forth" (Psalms 50:2), doesn't seem to be calling for devils. But then I don't know this history of Jerusalem during the Byzantine period, 4th/5th century. So far as wars and savages launched against Jerusalem, it was destroyed twice, attacked 52 times, captured/recaptured 44 times, and beseiged 23 times--perhaps this representation wasn't too terribly much out of the ordinary. Inventing (1) Old Tone in New Violins & (2) New Tone in Old Violins. Patent Models. Payne, R. H., and Broadbent, T. Feb. 17, 1903. In an instrument for reproducing sound, a resonating-chamber is used instead of a diaphragm and a trumpet. In the construction shown, the resonating-chamber consists of a violin body C mounted on an arm D extending from the instrument A. Fig. 2 shows means which may be employed for the mounting. The pin E passes through a hole in the neck C', which is clamped by the nut E'. The pin E is mounted in the wooden block F journalled in the fork H on the swivelling-pin. Washers G, G<1> prevent the communication of vibrations to the arm D. The hole in the neck may be dispensed with, a screw or spring clamp being employed in place of the pin E. The reproducer K, Fig. 3, is cemented to the violin belly. The style K<1> is clamped in it by the screw K<2>. The violin has the usual sound post and f-holes in the belly and also holes C<2> in the back. Strings may be stretched across the resonator. When a violin body is used, the strings are stretched by the usual pegs in the neck. This is not the most elegant invention for producing a more-interesting music from a stationary, non-human-played violin. The work is by Henry Konrad Sandell, and the patent was for a magnificent machine that produced 64 notes on the violin, and was accompanied by a 44-note piano, both played at the same time. It is a very impressive accomplishment, with several thousand of them produced over two dozen years by the Mills Novelty Company.